Cathy Heller is a talented musician. She's been signed by two major record labels, but unfortunately, she's also been dropped by two record labels. I've always told podcasters to go to their potential audience and find out what kind of content they need. 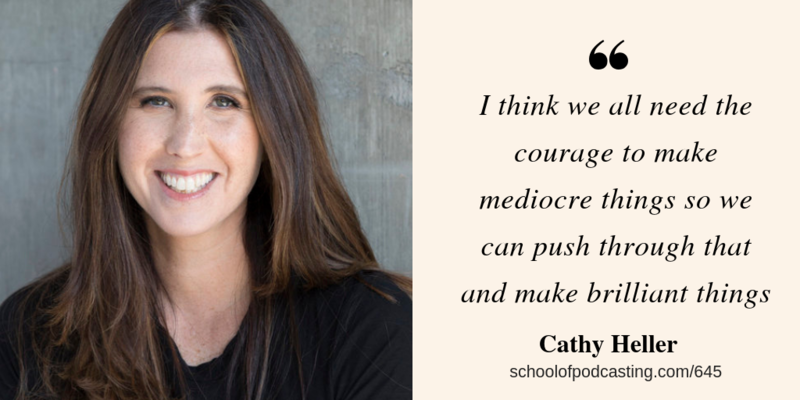 That is exactly what Cathy did, and it worked. She found out what type of music was being licensed into commercials, TV, and movies. When she created the type of music her audience (producers) needed it worked to the tune of hundreds of thousands of dollars. When things were going great, how did she pour gasoline on her success? She started a podcast (Don't Keep Your Day Job). She created 30 mediocre songs as she worked on making the type of music that would work in commercials, movie, TV, etc and threw them away. The difference between a hobby and a business is when you think of doing something for other people. Everyone has to start off being mediocre. It takes time and courage to start mediocre and then work on polishing your craft. Her music lead to her getting licenses which lead to her starting an agency, which lead to her creating courses, which lead to her hosting live events and all of these item fed each other. She had to do something that made her stand out. She did what she said she would do. 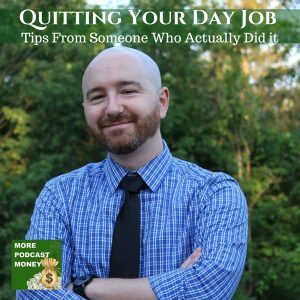 Tim Paige has done what many podcasters have dreamed of, he quit his day job. In a podcast on Facebook, he shared how he did it. 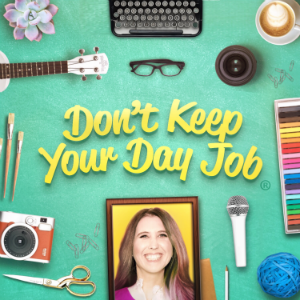 Don't quit your day job until it is costing you more money than keeping your day job. So if you turned down 40,000 worth of work because it conflicted with your 30,000 jobs, then it's time to quit your day job. This was the case for Tim. Tim also has a TREMENDOUSLY SUPPORTIVE Spouse. For more on this check out my last episode, The Three Things Every Podcast Needs (positioning yourself for the long haul). Tim got out of debt so that his expenses were minimal after quitting his job. He had three jobs doing anything he could to get out of debt and it took him three years. For the first three years of his side hustle, he reinvested in his business. Be open to opportunity. He didn't turn down jobs – even if he didn't want to do it. This makes him appreciate it when “dream jobs” come along. Get your mind right. When he panics, finds himself envious of others, he is not doing his best work. This hurts his business.